Well another Bounty Contract week has come and gone. How did this event go for you this time around? I do enjoy this event and tried my best to focus on encasing “contracts” in carbonite this time around. However, with the mechanics of some of the fights, even a couple henchmen, I was so busy trying to interrupt and not die, that most of the targets ended up not making it. I almost wish there was pause in the fighting once they got down to a certain number of hit points left and you get to make the choice to place them in carbonite or finish them off. What are some things you would like to see added or changed about this event? New Live Twitch.tv Arena demo tonight! There is another demo of the new Warzone Arenas today, September 19th, 2013, at 6:30 PDT, you can go to MMORPG.com’s official Twitch.tv site. This time around you can watch the guild from the Prophecy of the Five server, We Are Farmers, do battle in the new Warzone Arenas coming in Update 2.4. Below you can see details listed from SWTOR news article. BioWare released a Live Action promotional video. 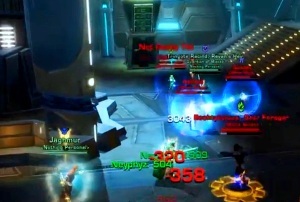 The video was added to the SWTOR site at the end of last week. The video is promoting everyone to “Join the Battle.” The neat aspect is that it is Live Action and yet there are elements of class weapons, abilities and a distinct line between the two factions. While I love the video and like the “real life” approach to promote the game, it does make me wish there were ways to have such huge epic battles as depicted in the video. Perhaps that might happen sometime in the future, we can always hope. Please enjoy the video clip and let us know what you think of this latest released promo for SWTOR in the comment section below. It has been such a long time since BioWare has given us a timeline update and this past week they gave us an article on the SWTOR site. Just like the other timelines this one is from Master Gnost-Dural. The subject matter for this timeline is the Dread Masters. 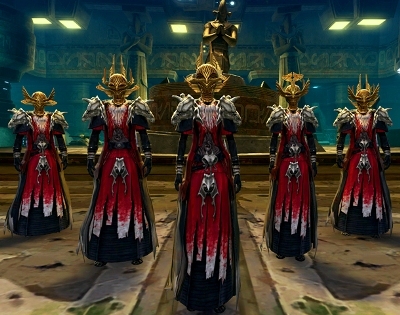 The article encompasses all the known knowledge of the Dread Masters to date. From their “stay” on Belsavis, and subsequent power moves by the Dread Masters throughout the galaxy, we see that although they are not associated with any faction, they are striving to gain power for their own agenda…whatever that might be. The article is very extensive and has a lot of facts about the Dread Masters and some attempts they have made to spread chaos fear and gain more of a power base. Be aware that the article does contain some potential spoilers. The one negative about this lore story is it was not done like the previous timelines and put into video form, but that said it does get everyone caught up with the story to date as we near Update 2.4 the Dread War. Most people in the SWTOR community have been aware of the class representatives and the first round of top three questions/issues for each class. The recent post below, by Eric Musco, talks about what will be happening with the system. According to Eric, after the questions from the first round have been answered for each class, the class reps will be put on hold. This is because anymore questions would prove meaningless until any changes have been made to the classes. Fear not, fellow SWTOR players, there is a silver lining. In the post, Eric states that class changes will be coming in Update 2.5. Considering we are already past the halfway point in September and Update 2.4 is scheduled to be introduced in October, this means another 4-6 weeks after that we should see class changes and the rest of Update 2.5. I’m sure during the time between Update 2.4 and 2.5 will be all kinds of balancing issues being brought to the developers with the new Warzone Arenas. Make sure to read through Eric’s dev post to get all the current details. As many of you are no doubt aware, we implemented the Class Representatives system a few weeks ago. The goal if this system was simple: introduce a dialog around each class based on what the community feels their top 3 issues are at the time. So far the reps have been doing a great job and you all have been providing invaluable feedback to the team. However, today I come with some good and bad news. First, the bad! Once we have returned the Shadow and Mercenary top 3 which were submitted last week, we will be putting it on hold. I know the first question that comes to mind is, why? This is pretty simple actually. All 8 set of class mirrors have submitted a top 3 to us once after this most recent round. With that being said, we have not yet made any actual class changes since the initiative began (barring the BH/Trooper changes). Because of this, the second set of top 3 will not really be as impactful since it will likely be a revisit of the same 3 issues that were presented before. Because of that, I am going to put the Class Reps on hold until we start making some class changes again. This leads us to the good news, right? I know the next question you will ask, based on what I just typed is “when are we getting class changes then?” I have that answer too! You will begin to see class changes in Game Update 2.5. After 2.5 hits, we will reintroduce the Class Reps and allow those reps to once again begin a dialog with the developers on what issues still remain with their classes. I will also rework the schedule to insure that only classes who received changes at that point are in the front of the schedule. I want to be clear that it is possible that not all classes will see changes in 2.5, but there are definitely some class changes coming. I also want to set the expectation that you shouldn’t expect crazy big changes like you saw with 2.0. but it will be a new set of changes. Also, if you don’t receive changes in 2.5 don’t fret as we will be continually touching class balance. Last but not least, one thing I want to do is to make sure that you are all informed on both the decisions we are making and why we are making them. To that end, as we get closer to the launch of 2.5 we will be publishing some class change blogs similar to what we did around 2.0. This way you can all be as informed as possible! We will definitely make an effort to stay active in the class forums and keep you all apprised of any updates, as well as making sure we are continuing to pass feedback on the dev team. I think that about wraps it up. If you have any questions I will stick around in the thread to try to answer them. Hopefully all of my ramblings make sense. tldr – Class Rep initiative is on hiatus after the Assassin/Merc answers until our next set of class changes come in 2.5. We are looking for people interested in helping to generate content for Corellian Run Radio. So, if you would like to write an article, create a video guide or maybe you have another idea altogether, please contact us. You just need to send us an email with your idea and a small writing sample to explain your skills and why you want to help out at Corellian Run Radio. Submit your ideas, a bit about yourself and a small writing sample to us at corellianrun@gmail.com. This week’s SWTOR fan made video is an in-game tour of Alderaan. Youtube user BleetToR did a great job of utilizing unique camera angles, location and movement to capture the scenery, flora and fauna of the planet. The video creator also did a nice job of showcasing the Royal Houses of Alderaan. The other great feature was using the in-game music associated with Alderaan. Be sure to check out the video and then go to their Youtube channel and leave a comment.